Discover your backbone and blow the lid off of last year’s test scores! Here you have it: no big and fancy education words and theories, no fairytale strategies, just down-and-dirty conversations that move schools from so-so performance to unprecedented success. 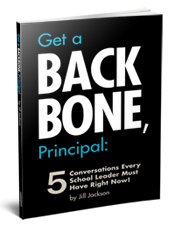 This book is your “get-out-of-school-improvement-jail-free” card and will coach you to find your leadership backbone so you can take control of your school. and that’s why they get results. You… Your instructional coach… Your teaching staff… Your department or grade teams… Your most resistant teacher. Take control of your school. Take control of the teaching. Take control of the results. Excellent principals that get results have some good skills, but more importantly they have a backbone. And they use it. People are talking… and it’s looking good! I recommend this book for any aspiring or current school administrator. The theme is straightforward and challenges readers (principals) to identify the instructional focus for their buildings to improve student learning. This isn’t “new” rocket science, however Ms. Jackson delivers the message in a practical manner from someone that has seen and been in schools across the U.S. I found this to be valuable as a central office administrator and wish I had it when I was a principal! I plan to purchase a copy for each of my principals. Reading this book is the next best thing to having an open-honest conversation with Jill! Written with her sense of humor, but down and dirty sense of style it’s like talking to someone who gets schools but also gets school improvement. Jill’s book is a quick-read that easily gets you to the work at hand – setting goals and expectations – then getting to work on those goals and expectations. Thanks, Jill! We eagerly await the next one! Plus $5 shipping and handling per book.
. Thank you so much!